I got out to do a bit more testing. This time I had a lot of wind and it was cold, 37F when we got to the field. Barb was a real trouper and took both video and some high speed continuous shots. Here’s a sequence of the one throw. 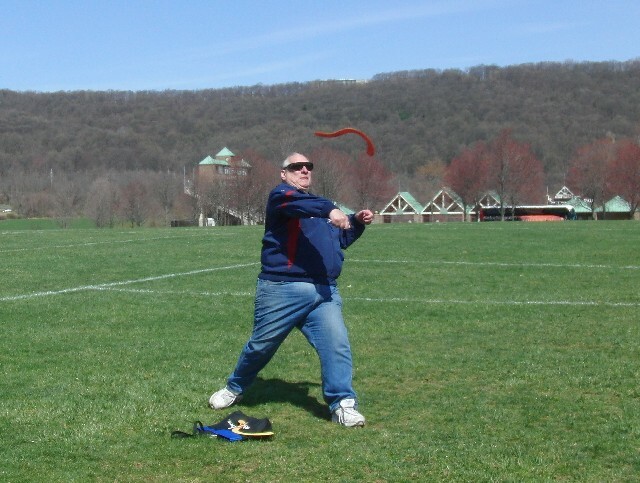 The sun came out Thursday, the temps hit 50F and I had nothing better to do at lunch (well, maybe eat) so I headed over to the field for some boomerang testing. 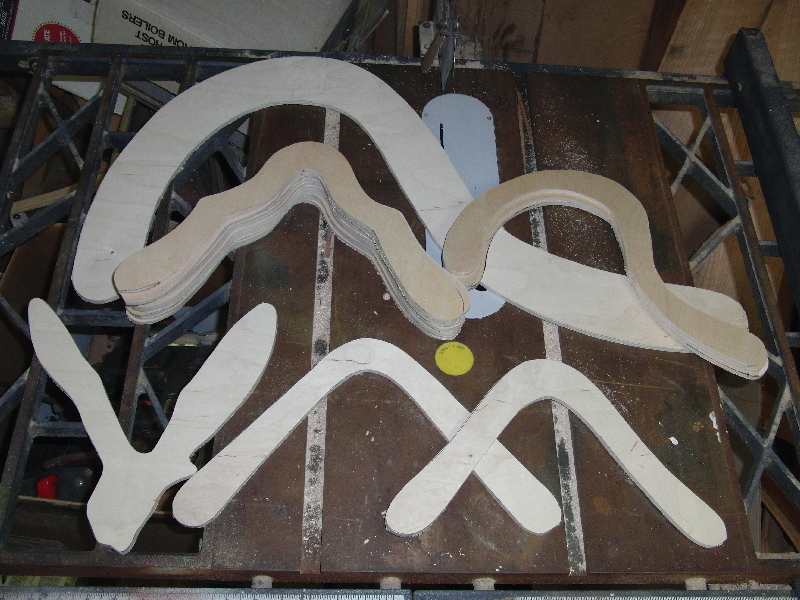 I had a few hardwood overlap boomerangs and plywood models to try so used them to “warm up”. The cherry overlap boomerangs flew very nice but were very short in rangs, barely making 20 meters. I think I may need to weight them for better performance. I needed to keep them very vertical when throwing. Of the plywood booms I had a Binghi Eagle copy in 5ply Finland birch which seemed to be shorter range than what I remembered. I’ll need to get out another and test them side by side. Moving on I had a copy of a boomerang by Bruce Bernstein. He has been working on a version of Herb Smith’s Veebo which Bruce now calls the Veebru. Bruce made one of these for Rob Stewart and Rob brought it to my house to show me it a few weeks ago. I traced the shape and made it in 1/4 inch 5ply Finland Birch. I had some room on the sheet around a large 30 inch wide Voyager I was making and filled in the spot with a few shapes. I was very impressed when I tested the boomerang. It had good range and a lot of hover at the end of the flight. Bruce has a real winner here. Then I switched to the 2mm 90% Voyagers. There was not much wind to speak of so I didn’t have high hopes. The first two throws came up short but close enough that I could see the boomerangs easily I gathered them and grabbed a few more. 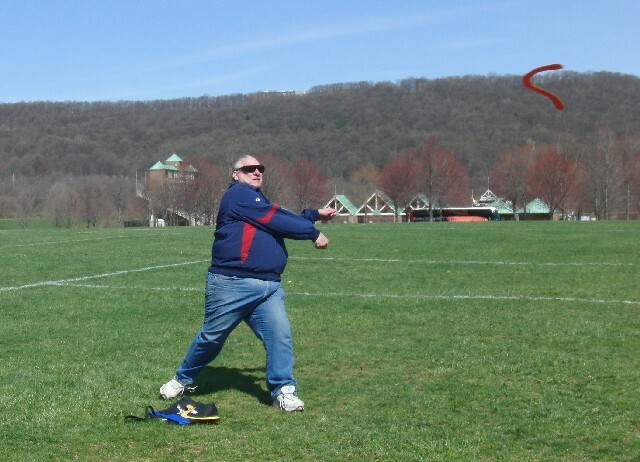 I think the long layoff from throwing wasn’t helping me any. I haven’t tossed any boomerang since November and throwing LD was not a good way to start the season. 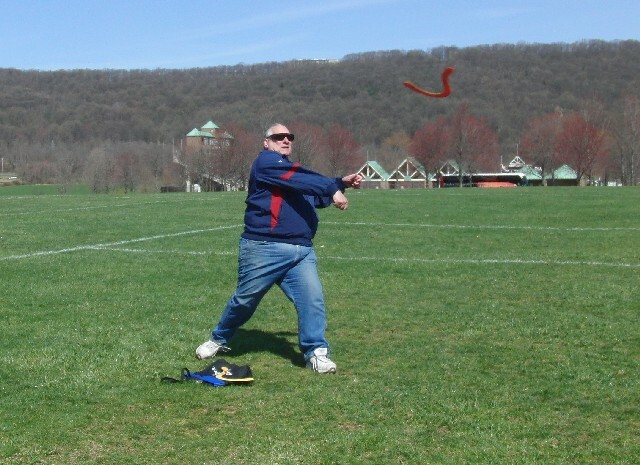 I guess I haven’t forgotten everything as the 4th boomerang came back so close that I was tempted to try and catch. It dropped to fast for that so I didn’t try. I was pretty amazed with the distances I was getting. As I worked my way through all 13 Voyagers I was pretty well pleased with them. Then there was one that rolled right at the apex and cam crashing back. The next boomerang stayed low and grounded out, rolling left. I put these aside. I finally got through all 13 and decided to retry the two that didn’t fare well. In a rather strange turn of events they did the same thing as before only the boomerangs switched bad flights with each other. How strange. I think those two either need work or lots of tuning. My lunch period was winding down and I gathered up my stuff and headed back to work. Something tells me my right shoulder is going to complain tonight or tomorrow. I need to work on some regular throwing before I try the 3mm Voyagers or I’ll never get them back. A few warmer spells (upper 30’s to low 40’s) had me sneaking into the garage to get some Voyagers shaped. I now have 20 Voyagers ready for their maiden voyages. Here is a photo of 15 of them. Now I am watching and waiting for the snow to melt off the fields (no sense losing white boomerangs in the snow) and for the fields to dry just a bit. Maybe next weekend I can do some real testing with these. I hope to get my spotter (Barb) to go with me for an extra set of eyes. 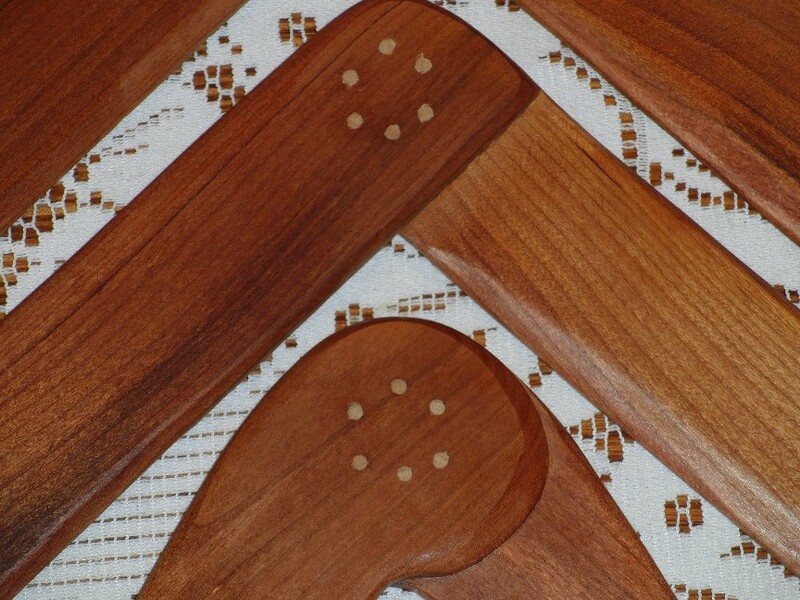 Here’s a followup to some of those cherry overlap boomerangs started over the weekend. 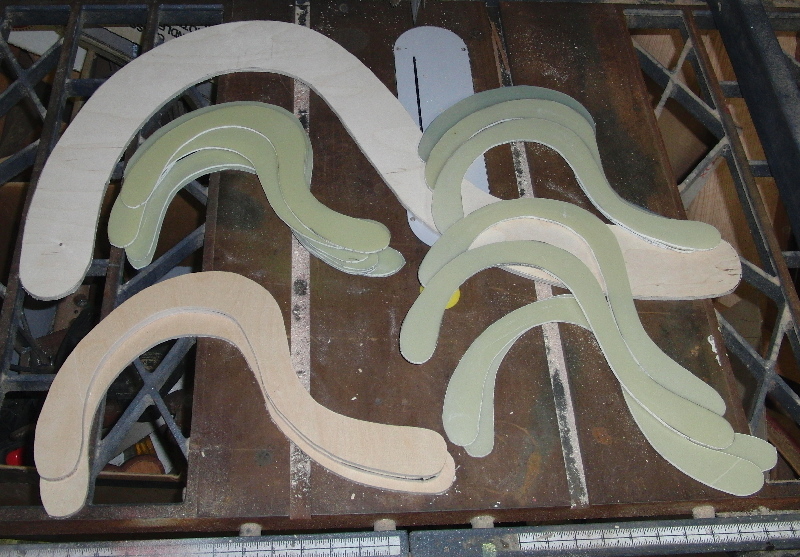 I drilled six 1/8 inch diameter holes in the elbows of each boomerang and inserted pieces of birch dowel in the holes. The dowels provide both joint support and a visual accent. 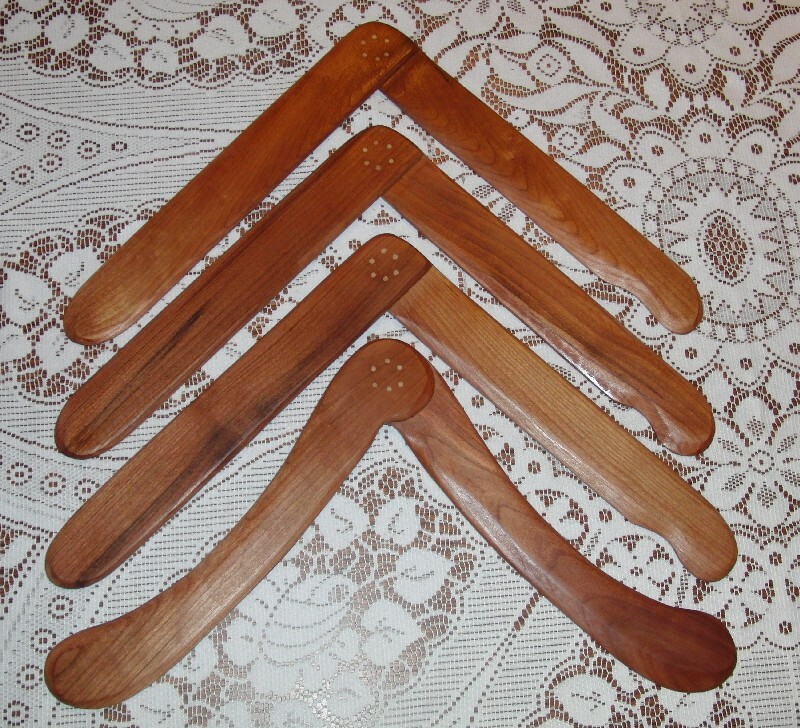 The boomerangs have 1 coat of tung oil finish on them and will get rubbed with steel wool before I add additional coats. They look pretty nice now. Ok, I had it with snow and was getting cabin fever. I had to do something. The snow was melting some and it looked like I could make a path to the boomerang shop. It was 35F on Saturday (that’s like maybe 1C) but it felt oddly warm. I shoveled the path and cleared the snow from in front of the door. I was in! Woohoo, what to do first? I had a few booms traced on a piece of 5 ply 6mm Finland birch sow attached them first. Then I decided to install the new carbide grit blade in the bandsaw. Working with gloves because of the cold didn’t make the job easier but I managed to get it in and tensioned. Next I tried to cut out some G10 Voyagers. I guess I should know by now that I can’t maneuver a 3 foot by 4 foot piece of G10 in my 14 inch bandsaw. 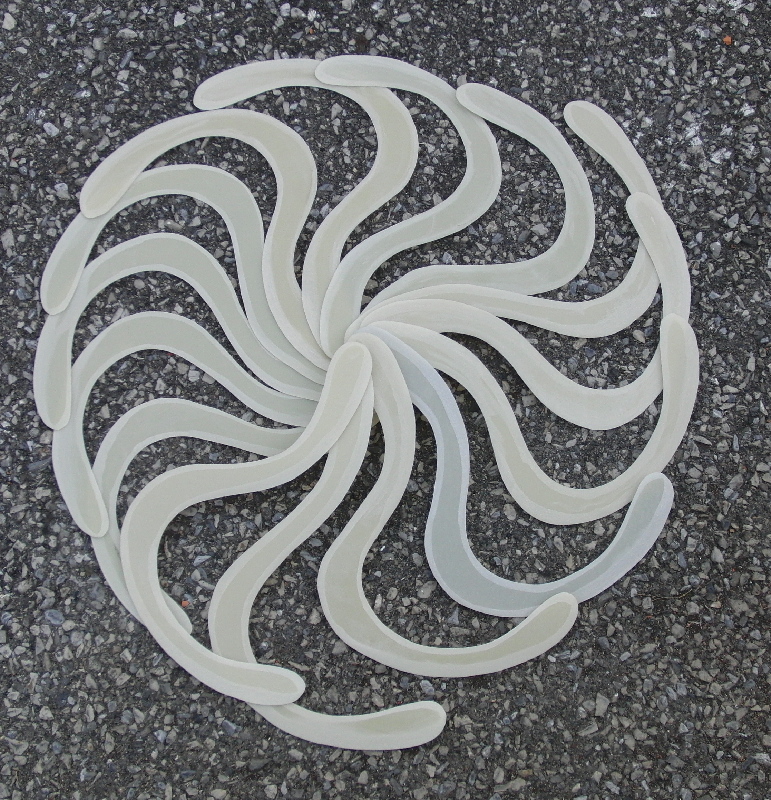 I eventually had to put a carbide grit blade in my portable scroll saw and separate the blanks from the sheet. Once the piece was in a manageable size it was pretty easy to cut out the blanks. The 2mm G10 cut like butter. The 3 mm was easy and actually I ad better control of it. I did run into problems wearing gloves. I have pretty good grip on plywood with the gloves but G10 is much slicker. I had to take the gloves of to maintain control. That meant my hands got cold and I had to stop working to warm up. All total I cut 15 Voyager blanks from G10 and a couple plywood shapes. Sunday was similar weather so I tried it again. This time I switched out the carbide blade for a regular blade and proceeded to cut 5mm 10 ply birch plywood. I cut some midi size Voyagers, and a bunch of my Dragonwing shape. 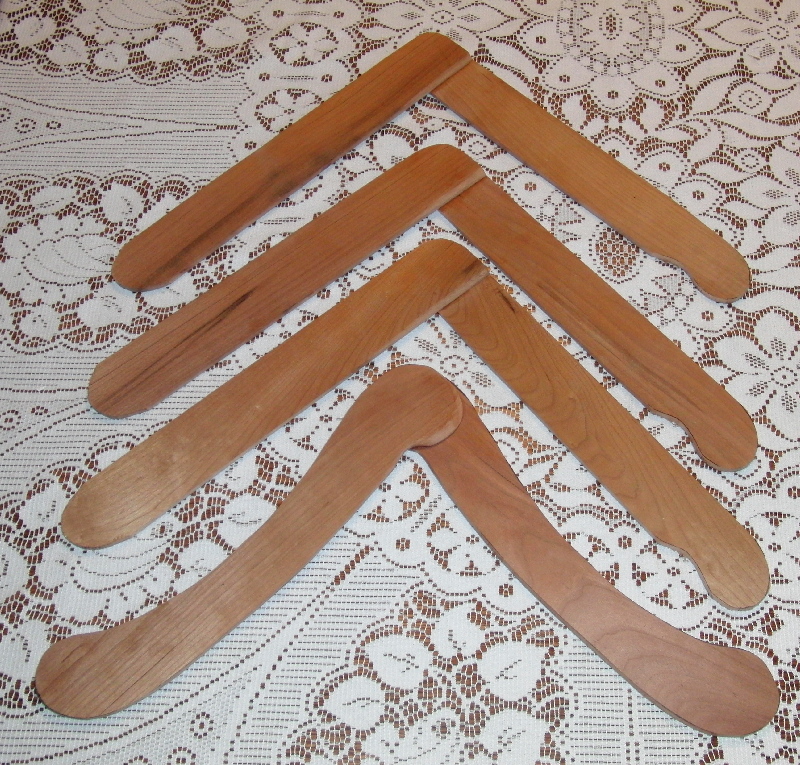 I also cut up some m3/16 inch thick cherry to make some Rusty Harding Concept Series boomerangs. It’s always nice to work with real wood. All in all I think I had a pretty good weekend. It was cold but I managed to cut out a bunch of boomerangs. Now as it warms up I have a mountain of sanding/shaping to do.